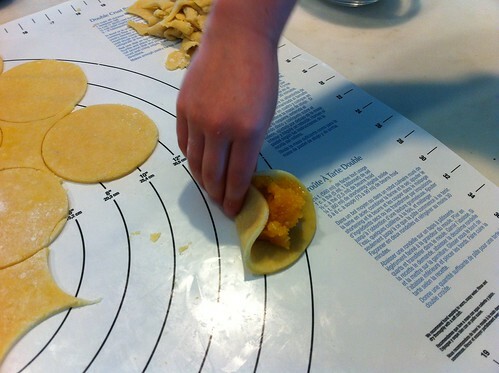 I dread making hamantashen ever year. They’re fussy little sugar cookies shaped into tri-cornered hats and filled with something yummy. 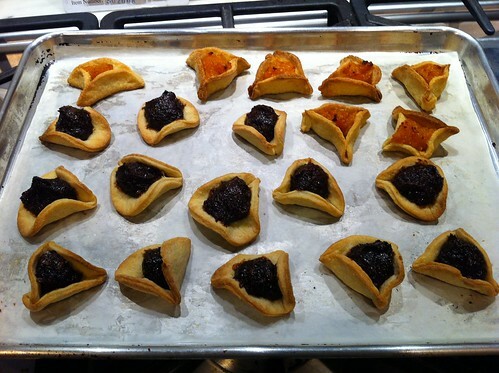 This year I filled them with homemade prune and apricot lekvar from my TWD/BWJ rugelach. 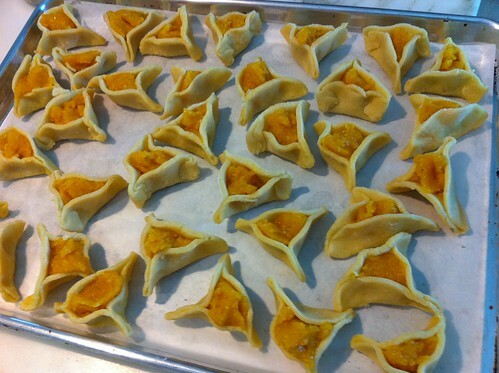 Perfect for Hamantashen. In years past, I’ve used chocolate chips, raspberry jam, apricot preserves, and once I made a cooked apple filling which was delicious, but perhaps too much work for a cookie that is already a lot of work. Know what I mean? But this year? it wasn’t so bad. I made the dough this morning, and then the cookies this afternoon and after dinner. And now they’re done. All that’s left is to distribute to friends! Put the dry ingredients into the bowl of your food processor, and give them a whirl so they’re mixed. Add the butter and cream cheese and pulse until it is the consistency of coarse crumbs. Add the eggs and vanilla. pulse some more. the dough will not come together into a ball. gather it into a ball on the counter and mash into a square or rectangle. wrap in saran wrap and cool in the fridge for at least an hour. Continue rolling cookies from the scraps. It’ll be a little harder to seal the corners, but even if they fall apart…they’ll still be tasty.